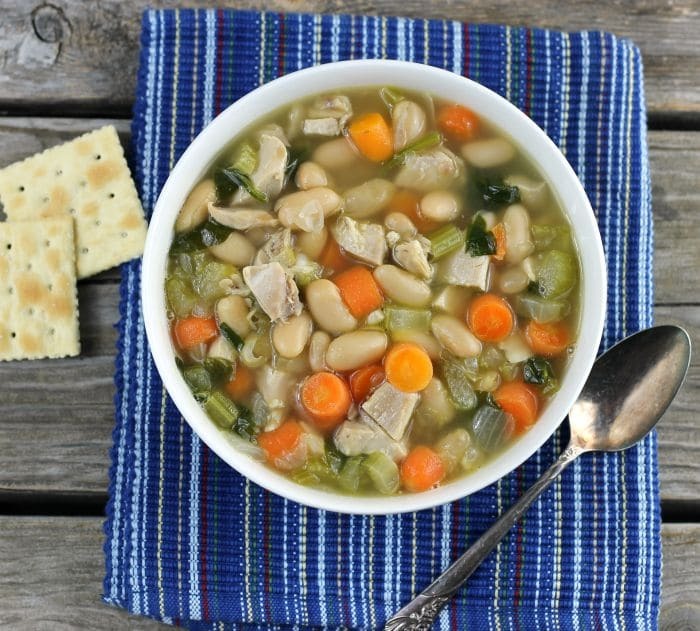 This chicken white bean soup is an easy soup to make, the canned beans help with the cooking time and it’s ready to eat in an hour or so. The season for soup making is in full force here at my house. 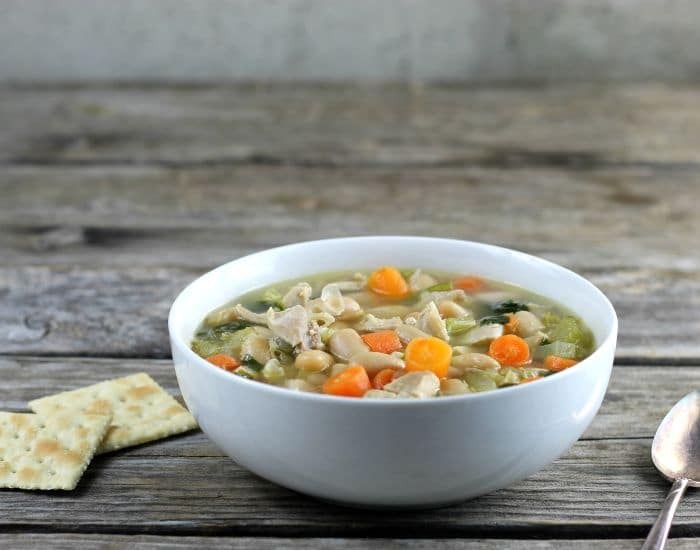 Besides a good casserole, there is nothing better than a hot bowl of soup to warm you up when the cold weather strikes. 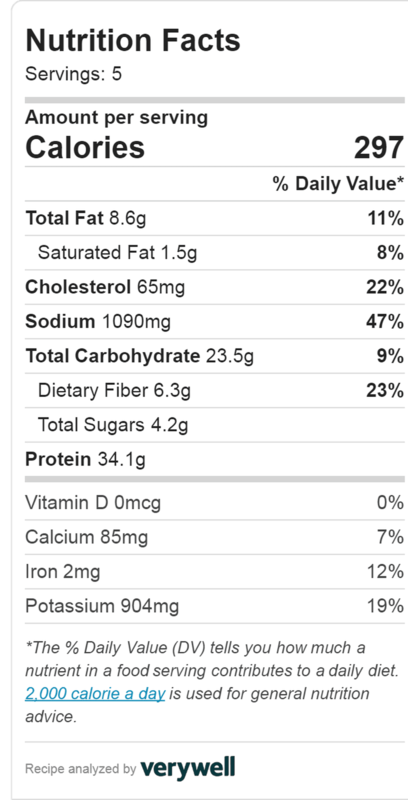 This chicken white bean soup is not full of flavor, I won’t lie. The tone of this soup is mild and comforting and I will admit that I really love it. Not that I don’t love soups that are full of flavor, but sometimes it is nice to have simple flavors. Do you need to use cannellini beans? No, you can use northern white beans or any white bean that you prefer. Do you have to use canned beans for this recipe? No, you can use dry beans for this recipe, but I would recommend that you soak the beans before adding them to the soup. You can put the beans in a large bowl and cover them with cool water and let them soak for 8 hours or overnight. To a large Dutch oven add the olive oil and heat over medium heat. Add the onion, celery, carrots, and garlic. Cook the vegetables for 10 to 12 minutes or until they start to get tender. Once the vegetables are tender add the beans, cooked chicken, chicken broth, and bay leaf. Turn the heat up to medium-high and bring the soup to a boil. Once it starts to boil reduce the heat slightly and continue to cook for about 20 to 30 minutes or until the vegetables are cooked. Add the chopped spinach 5 to 10 minutes before the soup is done cooking. This makes a perfect complete lunch for me. Love the combo of creamy white beans and tender chicken. This soup looks delicious Dawn, and I love these beans, somehow I feel that all white beans are creamier than the other ones. Looks so comforting…it sure makes a great meal. 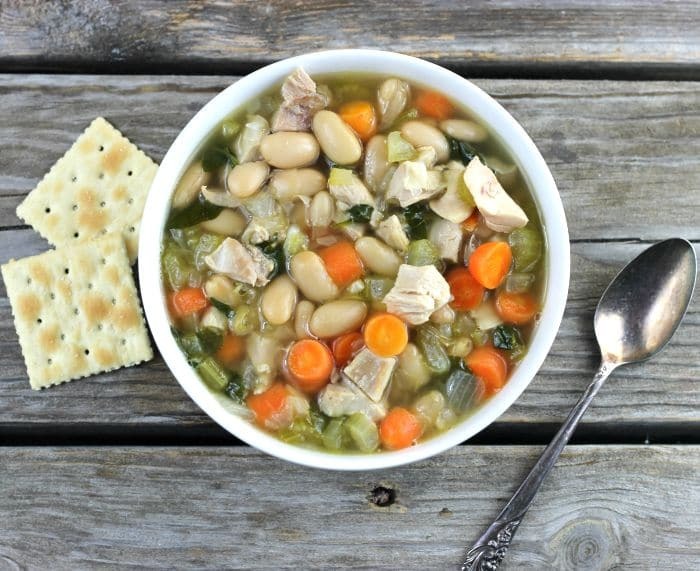 Such a wonderful, hearty soup filled with so many things I love…especially beans! 🙂 Perfect for this colder weather we’ve been having! Sounds good for this cool weather, I’d probably use northern beans though. Thanks for sharing! Such a hearty looking chicken soup. 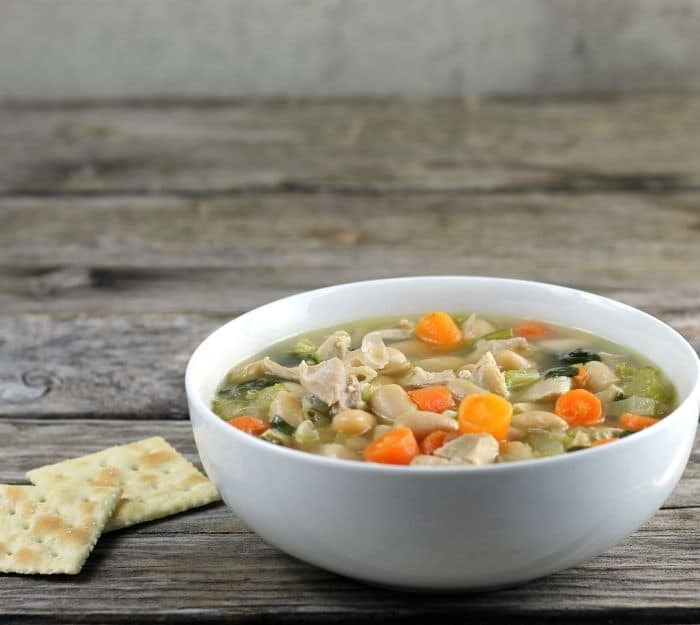 Nothing is better after a morning of shoveling snow or splitting firewood than a bowl of piping hot chicken soup. With the snow arriving soon and wood needing splitting I can see a pot of your soup warming on the kitchen stove. Oh, it is most definitely soup season here now! I think Fall just skipped us and we’re into early winter. And it’s been rainy, too. Ugh. 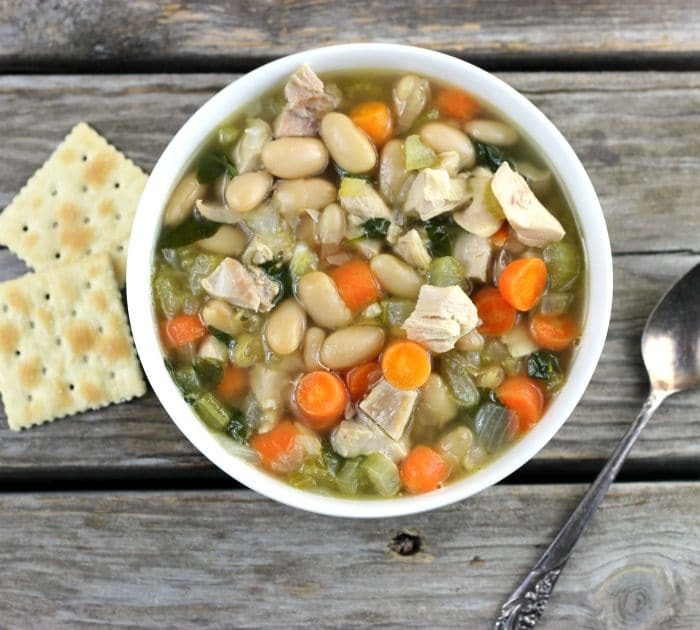 But a good soup is the key to making things better, and this chicken white bean soup sounds delicious! !